Home » article in english , sepeda » I found my stolen bike! I found my stolen bike! 13.30: Me, Vidya and Aqila went to buy some stuff in a store. We park our bike side by side and lock it together. 15.40: We finished shopping. Unfortunately, someone opened the lock. Vidya's bike was lost and another bike was not locked. 15.42: I decided to report this cases to the local police officer. 15.43: I MET THE THIEF ON MY WAY TO POLICE OFFICE! +-20-25 years old guy riding Vidya's bike. He was trying his new bike and did not recognize me. I try to hit the bike and he run. I cannot hit him, unfortunately I felt down. He drove away using Vidya's bike. 15.44: I drove back and try to chased at the back of him. Fortunately, I can still see him, going through the main square, and so on, and he went to his apartment. 15.48: I was too late, the door is locked, but I am 100% sure that the thief has entered the apartment with Vidya's bike. I made an emergency call: 122 (Remember this number! :EURO emergency call). 15.55: Officer came, 2 cars, 4 officer (2 men, 2 women). They opened the door. I was waiting outside. 15.58 - 17.00: I was interrogated in Police office. They were very kind and professional. 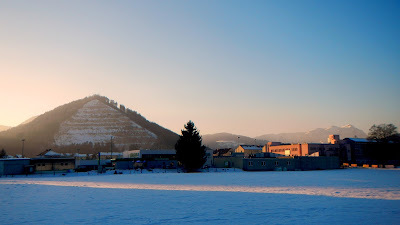 The report will be submitted to the Justizezentrum Leoben (court). I HOPE THEY FOUND THE THIEF. Thank you for quick response and cooperation. 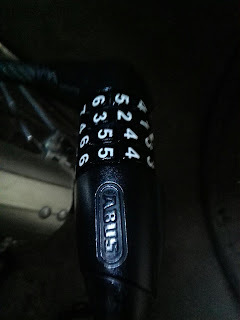 The officer said, locks with number combination were easy to be opened (although I know that my current lock is perfect-number combination, but then, after today, I changed my mind). They suggest to change with a locks+key. Congratulations AmazonPrime, you have new customer for bike accessories. Anyway, thank you officer for quick response. Vielen Dank LPD (Landes Polizei Direktion) Leoben! To Joel and Anung, I am sorry for this matter. I will make sure your bike is saved with me. Thank you for your trust. Alhamdulillah, masih diberi kepercayaan dari Allah buat menjaga amanah. Barang dikunci saja bisa hilang, apalagi ga dikunci. Abus juga buatan manusia. Waspadalah, waspadalah! Abus is still man made. Nothing is perfect.